If you visit Paris in the month or so before Easter, you will be tempted by fanciful chocolate displays in the windows of all of the candy shops, or les confiseries. 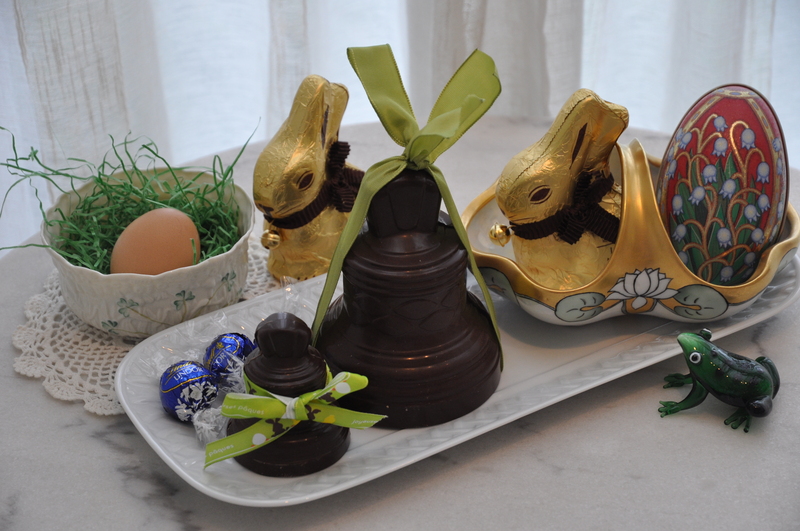 There are large and small, dark and milk chocolate Easter eggs, chicks, bunny rabbits, and … bells … even winged bells. That was a big surprise for my family when we arrived in France over 14 years ago. Why bells, especially bells with wings? We learned that many French parents, in this predominately Catholic country, tell their young children that on Thursday evening before Easter, called “Maundy Thursday,” all the church bells fly to Rome to visit the Pope, and thus, there are no bells ringing for a couple of days running up to Easter. Then, on Easter Sunday, the bells fly back to their empty, waiting steeples and ring out joyously on Easter morning. Happy Easter! Or, Joyeuses Pâques! Most families even say it is the flying bells (with wings) that deliver Easter treats and drop Easter eggs in the gardens for the children to find on egg hunts. Why not? Our ensuing family discussion on the matter had us arguing about which was more plausible: rabbits delivering and hiding eggs and baskets full of treats, or winged bells dropping chocolate eggs in gardens! You decide!